"Safari Reader removes annoying ads and other visual distractions from online articles. So you get the whole story and nothing but the story. It works like this: As you browse the web, Safari detects if you're on a web page with an article. Click the Reader icon in the Smart Address Field, and the article appears instantly in one continuous, clutter-free view. You see every page of the article — whether two or twenty. Onscreen controls let you email, print, and zoom." The feature works well, but the "Reader" option is not always available. It's quite difficult to detect news articles and to extract their content, so Safari's heuristics are far from perfect. Safari Reader is especially useful for sites that split articles into multiple pages to increase the number of page views. Some of these sites offer a printer-friendly version of the article, but that's usually difficult to read. If you're using Google Chrome, there's an extension called Readability Redux which offers similar features. 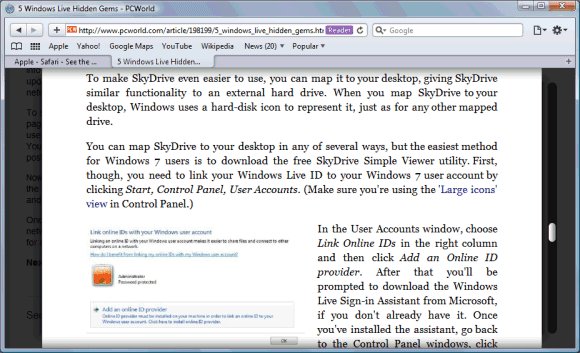 Firefox users can install the Readability extension. Both extensions are based on the Readability project, whose goal is to make "reading on the Web more enjoyable by removing the clutter around what you're reading". I like this functionality. I'm a little worried though that this will push the news organizations away from making content freely available (ad supported). I'm assuming that, in the case of the Safari feature, that is what Apple intends. If the publisher decides to sell the content then Apple can get its cut and can block material it doesn't like (for the iProducts). I guess this is parallel to their efforts to force as much as possible into the appstore/iTunes. Google Reader and other feed readers do an even better job then such plugins. However you must have the article in your feed to begin with. As for ads, many include ads in the body of the article, which is I guess OK, as long as it is clearly marked that it's an ad and not a part of the article. t looks like a quite complex algo the one adopted by Safari reader. I guess something more simple sticks behind this. Most probably a well W3C document with some SEO best practice like the one you mentioned. Most probably the reader is looking for something close to the new HTML 5 specific, so a class caller article or something like that. It's interesting to understand why Apple didn't disclose anything about this. This feature is good for music lyrics sites. There is also printfriendly.com which works quite well, and has a Chrome extension!